Haruhi Fujioka is searching for nothing more than a quiet place to study in the most elite high school academy in all of Japan when she stumbles across the mysterious third music room. Inside she encounters six beautiful men, the members of the host club. After they mistake her for a man, she breaks a priceless vase and is forced to become a member of the host club and do their bidding. Haruhi is such an amazing student for her grade level, so perhaps this will make her grades suffer? The school's unofficial motto is "Lineage counts first, wealth a close second," meaning students with stellar family backgrounds but low socioeconomic status may be given top priority over those from rich families with lesser pedigrees. 8770 users rated Ouran High School Host Club [TV]. 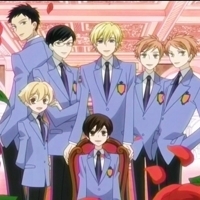 Return to Ouran High School Host Club.